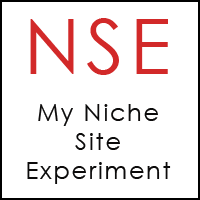 I just wanted to update you on my progress for my niche website experiment that I announced about a month ago. So far I’ve created about 12 pages for the site, but I have not officially launched them yet. I still need to fine tune some things, proofread and add more images. So right now, the site is still set to noindex/nofollow even though it’s live. In other words, the site has not been found/indexed by the search engines yet. As a reminder, I’m using The StudioPress Focus Theme (Genesis Framework). The site will consist of Posts and Pages, but definitely more pages than posts with a static homepage. For the record, this decision has less to do with search engine optimization and more to do with what makes sense for the structure of my site. I know some people argue that Posts are better than Pages for SEO or vice versa. I disagree and spoke about that here. Content is content. If it gets natural backlinks (internal and external) and becomes popular (social media shares), it will rank. Google doesn’t care whether it’s a Post or Page and I don’t get caught up in the difference from an SEO perspective. I also want to point out that static does not mean stale. I’ve heard a lot of people say they don’t like using static Pages because Google sees them as dated content. As long as you are updating your content, your site will be seen as “fresh” in the eyes of the search engines. Also, as your site gets comments, that will also add to the freshness of the page. So I’m not worried about the site being perceived as “stale” because I’m using more Pages than Posts. I’m being very careful to make sure my site isn’t over-optimized. No, I’m not calculating keyword density, counting keywords or anything like that, but I am not repeating the same phrase too often and using lots of variations. Back in the day I would interlink my pages using the same keywords in every link, but this time I’m making sure to vary my anchor text (the keywords inside the links) so it looks more natural. The domain name I chose is not an exact match domain, but it is a partial match. You may have heard that Google recently penalized some partial match domains. Some argue that you should not register exact or even partial match domains anymore. I disagree. It’s not that Google is penalizing exact or partial match domains. It’s just that you aren’t going to get the same benefit you would before. So websites that lost some rank did so because there weren’t enough other quality signals to justify the ranking. So yes, having the keywords in the domain is not as important as it was years ago, but I do try to include them as long as the name isn’t too long and doesn’t sound awkward. Having said that, if you can find a catchy name that is relatively short and includes your important keywords then go for it! Just don’t drive yourself bananas trying to get an exact or even partial match domain name. Also don’t forget about social media. Even though I am not going to be focusing on that right now, I did make sure to grab a domain that was under 16 characters so I wouldn’t have to chop/abbreviate the name for Twitter. Tip: If you haven’t started your site yet, check the availability of your potential name on YouTube, Twitter, Facebook, etc. before you commit. It’s bad for branding to create different spellings of your name for various accounts. I will not be adding AdSense ads for quite some time. It will be hard to know how much of an impact this will have on SEO but it certainly won’t hurt anything to have fewer ads. This is the first time I’ve ever done this. Usually I add AdSense ads right away, but I want to try something new with this experiment. I will be adding a few affiliate links, but I want to keep overall monetization very light — especially in the beginning. I can’t imagine creating a site today without a YouTube channel, so of course that will be part of my strategy. I have already created four videos and plan to launch them this week when my site officially launches. Once again, I’m using my “keep-it-real” approach that I believe is missing in this niche. One of the keys to building up my main YouTube channel in the early days was doing the opposite of what everyone else was doing. What I mean is there are thousands of videos on YouTube where people talk about how to make money online. Some of them are legit, others are downright scams. So instead of creating these hyped up videos about getting rich quickly, I created ones that focused on how much time and hard work it actually takes to make money online. Sure, this doesn’t sound as exciting as “Make $10,000 in Seven Days!” but these videos resonated with a lot of people because there was so much get-rich-quick hype and scams in my niche. People appreciated the honesty. So I’m taking this same approach with this YouTube channel by tackling some topics that others have already touched upon, but I’m adding my “keep-it-real” approach and addressing more of the myths, dangers, etc. I really like going this route because it does help you stand out. As I mentioned in my first post about this experiment, my goal is to get this site to rank on the first page of Google for the main keyword I’m targeting. This is not going to be easy, especially since SEO has changed so much and as many of you know, I’m not much of a backlink builder. That’s not to say I won’t do ANY backlink building, but I won’t be doing anything aggressive that could be considered gray or black hat. So I will keep you posted on my strategies in that department. Right now, I’m just focusing on content. This is the same approach I took with my experimental site I launched in 2011, and I just noticed this site had a record day on July 7th according to my WordPress.com Stats Plugin. In case you’re wondering, no, I’m still not manually building backlinks. And even though the site does have some that were naturally created, it doesn’t have very many. In fact, Google Webmaster Tools is showing ZERO backlinks (odd for a two year old site!) but I know there are some because the referrals show up in my traffic reports and other backlink reporting tools show them. I guess they just aren’t “important” enough for Google to list or recognize. Who knows? My methods for building a site are often undesirable by some of my followers because the results are slow. And for the record, I do believe there are ways to rank a website quickly. I’m not denying it’s possible. I just don’t engage in those aggressive tactics because I believe many are short-lived. The site referenced above is now two years old and it took about 6 months before it received any worthwhile traffic. But you know what? I’m OK with that. So far it has escaped all Google updates, and even though the traffic isn’t climbing all that fast, it’s stable. I’m in no hurry and would rather see results come slow and steady than fast and temporary. So if you’re following this experiment to see me rank a site in 1 month, you are probably going to be disappointed. So far, I’ve spent about 5 hours total on the site over the course of a week. That includes writing the content (most pages are between 700 and 1,000 words) and creating/editing the YouTube videos. The video creation and editing took up most of the time. So I just wanted to give you an update on where I am. I’m getting ready to remove the noindex tag and officially launch my content and videos soon. If you’re also participating, I’d love to hear about your progress so far! I try to build many manually backlink but it seem not so effective. From now i will focus on the quality content to generate more traffic naturally. Anyway, thank for sharing. I’ve just bookmarked your blog. I hope you will keep posting such articles that would help novices like me. Thank you for the information and All the best for your project! Thanks for the info . I need to ask 1 very important question. 🙁 how much time should i spend per day to earn a good income from blogging ? I’ve been working so hard on my blog which i created last month. I work hard for that but still its no use 🙁 Any advice? Good information Lisa, it is good that you are applying some of the lessons you have learned in the past. I have been following you for years now and have joined Website Babble. I am extreemly interested in your test results in that I am taking the same approach but in a different niche. I am sill learning but get extreemly frustrated with the slow progress. I am working hard on adding more quality to my content (Pages) but would like to better understand how to add value to my site for those who visit my site and my blog. Hi Lisa! This post is such an inspiration! I’ve just started working on my very first web site. Good luck to you with your projects! I am so glad I found your site… thank you for the update and for all the information you provide. Best of luck with this latest experiment! On a complete side note, I totally agree with what you are saying in regards to backlinks. Everyone says that backlinks matter but what I have personally witnessed is that time moves a website closer and closer to the top. My last website (leodimilo.com…which is now defunct and goes to my google account) was actually on page 2 for Internet Marketing before I shut ‘er down. This was without an aggressive link building campaign. I think that what happens is that people start adding backlinks and attribute any rise or fall to the actions they take when it may not be as important as they think. I mentioned this a couple years ago and was absolutely bombed (and called an idiot) for stating my observations. Anyway, good luck to you and your new niche website. Hey Lee, great to see you here! Yeah, if I have to resort to chasing backlinks to build up a site, I’d have to shut it down eventually. It takes away from the fun of this whole process anyway. Liked the point you said about EMD penalty . People dont understand that Google , with this update is just trying to -ve the spammy sites with EMD . So if you have right content you should not worry much about it anyway! when your niche site is up, how do you setup your backlinking plan for each day? So far I haven’t done any and am already getting Google traffic. I’m not a manual backlink builder.